ROCKINGHAM — If the other team can’t score, it can’t win. NaLee Jacobs and Makenzie Ward combined on a five-hitter with six strikeouts and Chelsea Davis powered the offense with a two-run homer over the left field fence to lead No. 5 Richmond Senior past No. 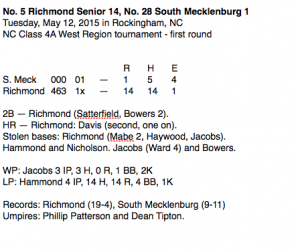 28 South Mecklenburg 14-1 in the opening round of the North Carolina Class 4A West Region tournament. 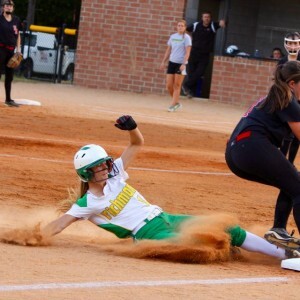 Kelsey Mabe slides safely into third base in a four-run first inning. It was the postseason debut for both pitchers and Raiders coach Wendy Wallace couldn’t be more pleased with their debut performance. Jacobs and a solid defense held the Sabres scoreless through three innings. From the outset, however, it appeared as if the game could go a different way altogether. After Novalea Hammond led off the top of the first with a groundout, the next three batters reached base. Brittian Bilon singled to center and Katie Allison roped a single past third baseman Doodle Jacobs and Shelby Lazanby managed to get a weak grounder past Davis at first base. Bases loaded, one out: Advantage South Mecklenburg. But it didn’t last. Jacobs settled down and started hitting right where catcher Owen Bowers called for each pitch. 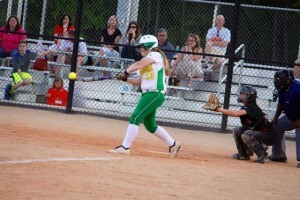 Maddy Nicholson struck out looking and Taylor Cox swung at the third strike to end the inning. Once the Raiders’ offense stepped to the plate, some fans might have wondered if the Sabres would ever have another offensive opportunity. Richmond (19-4) gave them good reason to doubt it. Kelsey Mabe reached first on a walk, quickly stole second, then third and scored when Jacobs slapped an RBI single past second for a 1-0 Richmond lead. Caroline Wilson is about to connect for a run-scoring single to push Richmond’s lead to 10-0. Katie Satterfield hit into a sacrifice that moved Jacobs to third. Davis worked a walk from Hammond, but an opportunistic Jacobs raced home for a 2-0 lead. 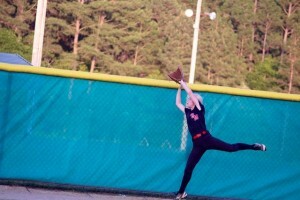 While South Mecklenburg’s squad was reeling from the surprise, Satterfield advanced to second without a throw. The aggressiveness paid off when Owen Bowers knocked an RBI double to left to score Satterfield to lift the Raiders to a 3-0 advantage. Peyton Fann capped the inning with a run-scoring double to center. After a quiet top of the second, the Raiders went on the offensive again in their half of the inning. Carleigh Howard reached first on an error and stole second. Mabe’s effort was mishandled, and Howard scored for a 5-0 lead and left Mabe standing on second. Jacobs then shot a grounder to second, but a throwing error let Mabe score with Jacobs on first. Jacobs stole second and scored on Satterfield’s RBI double to left. Raiders 7, Sabres 0. Satterfield didn’t have to steal a base, as Davis powered an offering from Hammond over the left field fence for a two-run home run — her 10th of the season — to put Richmond up 9-0. A ball hit by Chelsea Davis in the second inning is just out of the reach of South Mecklenburg left fielder Brittian Bilon for a two-run home run. “I’m really good at hitting inside pitches,” Davis said. Davis spoke of the — if not casual approach, then certainly relaxed — the Raiders had before the first pitch. 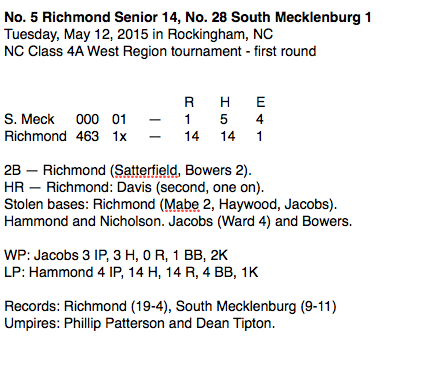 Richmond lost the Southeast Conference Tournament championship game — a 5-4 defeat to rival Scotland — and lost two of its last four games. The Raiders will play the winner Wednesday’s game between No. 12 Scotland and No. 21 Southwest Guilford. The game is scheduled to be played at 7 p.m. on Saturday. “We know it seemed like we lost a little bit of focus at the end of the season,” Wallace said. Wallace, however, was able to get her team in gear. Davis said Monday’s practice in high heat was particularly tough and allowed them the chance to refocus. “It could be one and done,” Wallace said of the single-elimination playoff tournament. Caroline Wilson’s single knock in Haleigh Denham, who reached on a walk. After only two innings of play, the Raiders led by 10 — taking full advantage of three South Mecklenburg errors in the second. Ward started warming up in the bullpen in the bottom of the third inning. With two quick outs by the Raiders offense, Wallace turned from the third base coach’s box and asked Ward if she was ready. “I don’t know,” Ward said timidly. The answer, as it turned out, was yes. Richmond extended the inning — scoring three times, on an RBI double by Bowers and run-scoring singles from Fann and pinch-hitter Jarae Nicholson — and allowed Ward more time to get ready. By the time she reached the pitcher’s circle, it was the Sabres who weren’t ready. Ward struck out the side — all three looking — in the top of the fourth and added a fourth strikeout in the fifth.